Если вы на момент этого квеста выполняете попутно цепочку квестов на артефакт, то нужно сначала завершить цепочку квестов на артефакт, и только потом спускаться в клоаку. Иначе в клоаке вы не найдете данного нипа, т.к. он будет в другом измерении :). В клоаке вы вообще не найдете никого, вы просто будете в отдельной фазировке. Сам наткнулся на данную, мягко сказать, неприятность, пока не прочел коменты бургов. Гарольд Уинстон находится в Клоаке Даларана, в центральной комнате, его нужно прибить и забрать с тела Сумка с настоящими самоцветами. Клоака теперь ПвП зона, так что если боитесь за себя, возьмите бафф охраны у Ретан. Если заходить через проход у Площадки Красуса, то найдете его в домике после лестницы. When you enter Underbelly you get Стража канализации or Без стражи debuff. Стража канализации means the guards are on their posts and no PvP is allowed.Без стражи means there is no guards and Underbelly becomes free for all PvP zone. Guard Captain Ретан is the one controlling the guards. You can hire personal guard if guards are not on their posts for 5 gold and you'll not be flagged for PvP. The most irritating thing about this quest is the PVP element. I keep getting killed when I try to do anything. My PVP is disabled but keeps coming on intermittently and I'm not hugely into PVP so it's annoying, waiting for the guards to return to stop the PVP can seem like a long wait! The quest took me about 15 minutes to complete because of this! For Alliance PVP characters, this quest is idiotic. Level 110 guys camp out and kill everyone and everything not Horde. My level 102 pally has been insta-killed four times now before I can move 10 feet from my previous corpse. If you enter the underbelly at the entrance which is under the Violet Citadel on the map (35, 45), then you should be able to get this guy without getting flagged for PVP. Utterly ridiculous to put a proffession quest inside a PVP area. I cannot go in without the PVP sword showing no matter which way I try to reach the NPC. The other thing is you cannot see when the guards are stopping PVP when you are dead so I don't know when to res for safety. I've wasted soooo much time on this its getting really annoying.I will have to place another of my faction characters near the area to see when the guards are in effect and hope I don't go close enough to trigger PVP. Like the other poster said - well thought out Blizzard. Sheesh. This quest is a load of utter horse . If all the PVP mouthbreathers want to spend all day and all night killing each other, they should be kept isolated so they don't infect the rest of us, so I'm fine with the Dalaran underground being a wanton pit of madness and monkeys throwing at everything. But whoever had the bright idea of putting a quest objective NPC in a free for all PVP zone needs to have his removed in the most painful way possible. So, I wasted 5 gold to get a bodyguard, hoping that it wouldn't flag me for pvp. I walk five feet past the sanctuary zone, and suddenly I notice my health going down! I got hit by some AOE spam attack, and the guard turned out to be completely useless. I got flagged for PVP, tried to run back to safety, and ended up DYING INSIDE THE SANCTUARY because I'd been covered in about 18 million DOT's. It took me half an hour just to GET to Harold Winston, only to realize... there is a ten second delay between talking to him... and him becoming hostile. It took me THREE HOURS and over a thousand gold worth in repairs. Absolute trash Blizz, absolute trash. Just did this quest myself. Thought I'd be good to go if I employed the services of a bodyguard. After I started attacking Winston, some other players currently doing what people in the underbelly do best - hit everything in sight, attacked Winston, and suddenly I become flagged. I had the stopwatch going as well to make sure I got out in time. It was at around the 1-minute mark. The bodyguard suddenly leaving for some reason is a real drag. I got 1-shot by a 300k+ Rising Sun Kick. And ganked again on my way out. All they need to do is make sure nothing can cause the bodyguard to suddenly abandon you for no reason and the quest, and other similar quests involving trips to the underbelly, will be fine. There seems to be an issue with not being able to reach your body when if you are attacked by another player and end up dying. The problem is that when you run down to where your corpse is it kept giving me the "You must enter the instance to recover your corpse." I reloaded my UI, logged out then back in, disabled my addons but nothing I tried worked so I took a hit to my pride and ended up taking Слабость после воскрешения then was fortunate enough to tag Гарольд Уинстон when a Draenei was just about to down him. But if anyone knows anther way to reach your body without taking rez sickness, it would be extremely helpful. Гарольд Уинстон located in the Underbelly, he stands in the central room, you have to defeat him and grab Сумка с настоящими самоцветами. Underbelly is FFA PVP zone, so if you dont want to be killed, you can buy personal guard buff from Ретан npc. He can be found in a tent, if you entered throung the entrance right from Krasus landing pass. 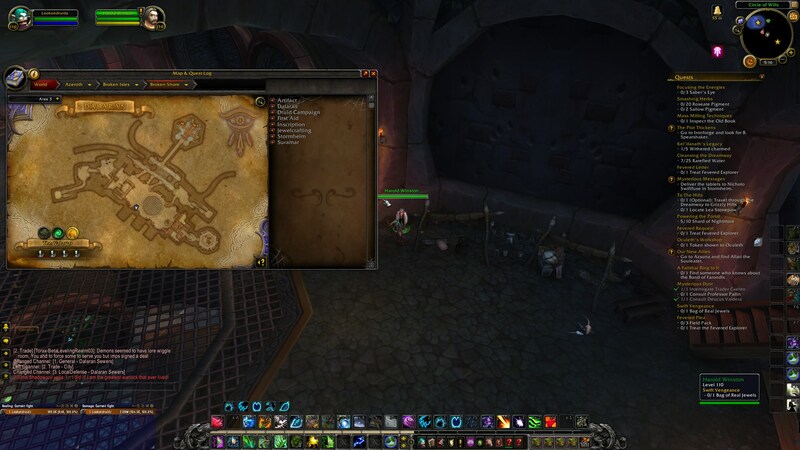 and I thought Bliztard was putting up and down arrows to help find things! Bliztard strikes again! I killed Harry Winston, which is odd because he died in the seventies, I think. Then somebody killed me. No big deal; I'll just go back and rez on his corpse and do an insta-loot. But when I got there, he had self-rezzed. How could that happen? Wait...legal marijuana in California? Yup. There's the answer. Surprised Blizz lets its employees smoke dope on company time. Отыщите Гарольда Уинстона в Клоаке Даларана. <имя>, я прошу тебя отыскать моего БЫВШЕГО компаньона Гарольда Уинстона. Учитывая, где мы находимся, вряд ли он успел уйти далеко. Когда найдешь его, забери все, что он украл, и верни мне. Даю тебе полный карт-бланш. А насчет бриллиантов мисс Мур не беспокойся – я лично доставлю ей камни из новой поставки. Ты его нашел? Получилось вернуть камни? Отлично. Все на месте. Судя по всему, это те самые, настоящие камни. И как же ты... а впрочем, неважно. Мне до этого дела нет.